The ASUS ZenPad 7.0 is a cheap and cheerful mini-tablet. Powered by the low-cost Intel Atom x3 chip, it is never going to win any speed race. If you are looking for a mobile 3D gaming machine, then this is not what you are looking for. But it is perfect for 2D games and video playback, as well as office work. When we reviewed the ASUS ZenPad 7.0, one of our biggest gripe was its rather limited battery life. It can last up to 6 hours with light use, or 4.5 hours of heavy use (PCMark rated) and about 3.5 hours if you are playing games on it. But ASUS has just the solution for you – the ASUS Power Case (CB71) for the ZenPad 7.0! The ASUS Power Case comes in a classy-looking cardboard box. The large ASUS ZenPad 7.0 branding in the front makes it clear that this Power Case is specifically designed for the ZenPad 7.0, not its larger brother – the ZenPad 8.0. Inside, you will find the Power Case nestled within a corrugated cardboard box. The box has a small compartment, with the USB charging dongle for the Power Case hiding inside. We have also prepared a video of our unboxing of the ASUS Power Case for the ZenPad 7.0 tablet. Check it out! 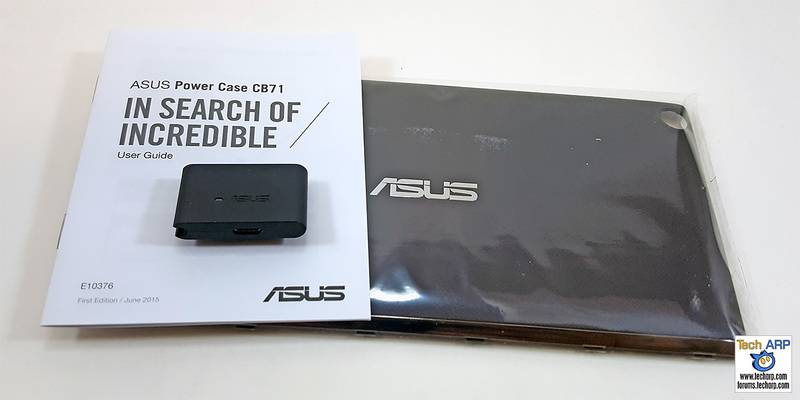 The ASUS Power Case package consists of the Power Case, a USB charging dongle, and a User Guide.